The Kootub, near Delhi. The north-east corner of the inner enclosure. bl.uk > Online Gallery Home	> Online exhibitions	> Asia, Pacific and Africa Collections	> The Kootub, near Delhi. The north-east corner of the inner enclosure. Print from an album of 80 albumen prints taken by Eugene Clutterbuck Impey. The Qutub Minar Complex encompasses the earliest great monuments of Muslim rule in India. The partly ruined complex is built on the site of Lal Kot, an earlier city which was the seat of the Rajputs who were defeated by the armies of Mohammad Ghori, the conqueror of North India. It contains the Quwwat-ul-Islam, the first congregational mosque in Delhi, the celebrated minaret known as the Qutub Minar, the Alai Darwaza or the 'Lofty Gateway', and a tomb believed to be that of Sultan Iltutmish (reigned 1211-36). The mosque was founded in 1192 by Qutub-ud-din Aibak, the commander of the armies of Mohammad Ghori. Although the design stems from Islamic architecture, masonry from 27 temples was used in the construction. The central courtyard is surrounded by collonaded cloisters and the re-used temple columns can be seen in the photograph. 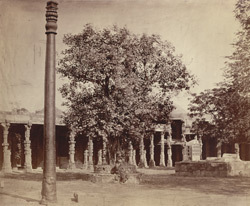 The courtyard contains the famed Iron Pillar (also seen), a tapering column 7.21 ms high which was a victory standard or dhvajasthambha as its inscription states. Dating from the 4th century, it is a relic of the Gupta period cast in a pure, non-corrosive iron. Nothing is known of how it came to be here. It was probably crowned by a garuda figure, which no longer survives. Qutub-ud-din Aibak may have either placed or retained the standard as a victory symbol.